The application period for summer 2019 is closed. Thank you for your interest in working for the Heritage Documentation Programs. Positions are open only to United States citizens. Foreign citizens seeking summer employment may wish to look for opportunities via the U.S. National Committee of the International Council on Monuments and Sites (US/ICOMOS). 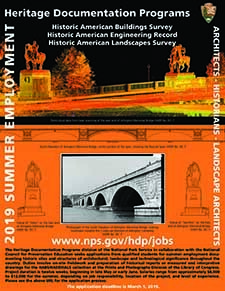 Applicants who wish to be considered for both Architect/Landscape Architect and Historian positions must submit two separate and complete applications. Applicants who wish to be considered for other NCPE internships (not with HDP) must submit separate applications directly to NCPE.